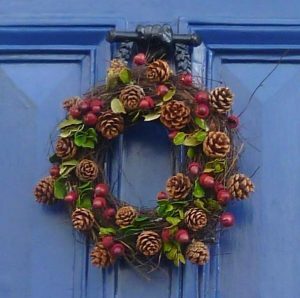 I’ve been very struck this year by the number of Christmas wreaths hanging on front doors. A few years ago, hardly any doors had one but, this year, they are everywhere. I went for a walk with my camera to have a proper look at them. Red bow: best in show? 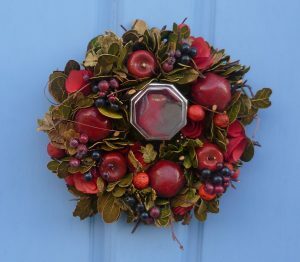 The red apples and bay leaves wreath is seriously classy and it fits snuggly round the central knob you pull to close the door – a feature of many Regency terrace houses. The red apples and berries are intertwined with bay leaves – and they look good enough to eat. This one looks as though it might have been hand-made; I like the natural effect of the decorations being allowed to spread about a bit. It’s Christmassy but in an unusual way. The silver ball at the bottom is, in fact, the knob to close the door. 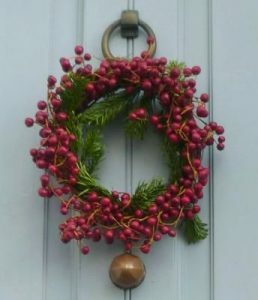 The crimson berries really stand out in this wreath which hangs neatly from the brass ring doorknocker. 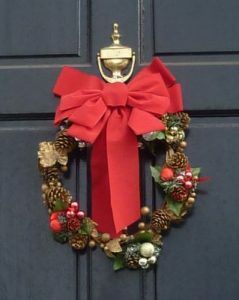 At first I thought that there was a gold ball hanging at the bottom of the wreath but, on closer inspection, I realized that it was also a knob to close the door. 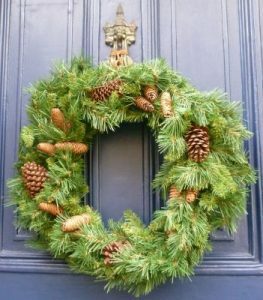 I really liked this wreath for its bushiness – it’s a generous wreath – and the choice of large and small pine cones. The unusual colours caught my attention; it stands out particularly well against the pale lilac-blue of the door. Perhaps an artist lives here. 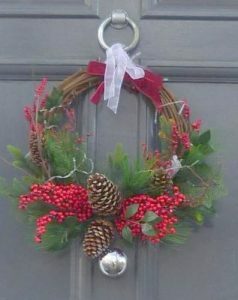 This wreath hangs from the door of a friend of mine who is an architect. He has painted a trompe d’oeil with differently-shaded triangles on the panels so that they look as though they are three-dimensional. Note the door-knocker of a clenched fist holding a bar with a black wreath hanging down which is partially obscured by the wreath. Initially, I thought I’d arrange the wreaths in order of preference – but decided that that went against the spirit of Christmas. Instead, I’ve tried to show off their variety; they are all beautiful and light up a dull December day. I really love the bushy green one. Actually, I wondered whether that might not be home-made as well. It has a sort of generous exuberance about it that looks personal. I agree with you, Sophie. It’s a bit larger than any of the others, for a start. I also love its exuberance; it’s the way the pale green leaves are shooting out in all directions. I half expect a red squirrel to come and take up residence! I like the berry one best. It looks luscious. But they are all lovely and I’m delighted to hear you have found them all over the place. Such a lovely idea. I like the berry one, too, Elizabeth. The cerise colour of the berries (they’re not quite scarlet but not quite crimson either) look particularly good against the pale grey door. All very beautiful. Think the apples get my vote. I also like how they incorporate the door knob into the wreaths! I know what you mean, Jan. When I first saw the wreath, I thought the knob was a bit of precious metal cunningly integrated into the wreath itself. It’s a sophisticated piece of art – perhaps inspired by a Florentine wreath from the Italian Renaissance!